Album cover for U. K. issue. The covers for the other Columbia sets were similar. For an example of one of the U. S. covers, see the Columbia Iolanthe. This was the third of a series of four abridged sets on the Columbia label. The series was successful, although the short span of time between the recordings suggests that Columbia already had a series in mind when the first set was made. The purpose of the series, apparently, was to compete with the D'Oyly Carte sets by issuing on the smaller 10" discs (as opposed to HMV's 12" discs), which could be played on less-expensive equipment. George Portland, better known as George Baker, sings here under a pseudonym, possibly to avoid offending HMV, with whom he was in effect competing. Francis speculates that some of the other singers may also have been using assumed names. However, Nellie Walker also appeared on many of the HMV sets, but sang here under her own name. D'Oyly Carte's own abridged sets, also on 10" discs, seem to have been inspired by the success of the Columbia recordings. Indeed, the first studio session for the 1931 Yeomen, which was the first D'Oyly Carte abridged set, came on the same day as the last session for this recording. George Baker and Nellie Walker sang in both sets, but in different roles. The third album of bird's-eye Savoy Operas follows the lines of its predecessors The Mikado and The Gondoiiers, and contains seventeen selections from The Yeoman [sic] of the Guard on six records (Col. DB434-439, 10in., 3s. each, or complete in album with book of the words, 18s.). The Columbia Light Opera Company, conducted by Joseph Batten deal faithfully with words and music of the romance of the Tower of London in the sixteenth century which was Gilbert and Sullivan's most nearly serious Savoy opera; and since I have a song to sing,O! is not heard in this abridged version till the final scene, it so happens that all the best-known numbers come in the last three records. Perhaps 438, containing A man who would woo a fair maid and When a wooer goes a-wooing (Miss Alice Lilley makes a verbal slip at the beginning), is the pick of the half-dozen, with 437 and 439 as close rivals. But when one has been heard, the only sensible course is to get the whole album. George Portland, who sings Sergeant Merryll's and Wilfred Shadbolt's parts, has notably curbed his tendency to insert aitches in the middle of words. The same opera, by a curious coincidence, has been abridged by the Gramophone Co. (H.M.V. B3799-3804. in album, 18s.) with Dr. Malcolm Sargent conducting and under the direction of Rupert D'Oyly Carte. Whether this is the first fruits of the merger or the last leaves of an earlier chapter, I do not know, and not having yet heard the records I cannot compare them with the Columbias; but the arrangement of the excerpts is different, and though Nellie Walker is in both casts, she does not sing the same numbers. Derek Oldham plays Fairfax and George Baker Point. Note: Three selections from this recording were included in the Sir Arthur Sullivan Society's cassette re-issue of HMV's abridged 1931 Yeomen. 4 WA11287-2 4. "Alas! I waver to and fro!" 5 WA11288-1 6. "Didst thou not, oh, Leonard Meryll"
8 WA11091-2 11. 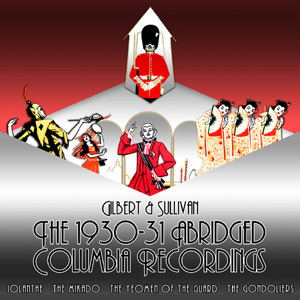 "Free from his fetters grim"
The matrix numbers for the Columbia Iolanthe, Mikado and Yeomen were pre-assigned in the issue sequence of the selections; hence, unlike many of the HMV 78rpm sets, one cannot determine the recording order by sorting the matrix numbers. From the Recording Date column, however, we can see that the company recorded three sides per day on each of two days (3 and 5 March), and the other six sides on 4 March. This observation certainly puts the "take numbers" (a "-1", "-2" or "-3" after the base matrix number) in question. If, as these numbers suggest, the first or second take was published for all but one of the sides, it should have been possible to record more than 3 sides on 3 and 5 March. The selections are numbered consecutively from 1 to 17, as shown below. Three of the Columbia sets are similarly numbered, but for The Mikado they used "a" and "b" to distinguish multiple selections on the same side. Joseph Batten is credted as the sole conductor on the labels, but Clarence Reybould conducts sides 6, 8 and 11.